Ildar Abdrazakov has established himself as one of opera’s most sought-after basses. Since making his La Scala debut in 2001 at 25, the Russian native has become a mainstay at leading houses worldwide, including New York’s Metropolitan Opera, the Vienna State Opera and Munich’s Bavarian State Opera. His powerful yet refined voice coupled with his compelling stage presence have prompted critics to hail him as a “sensational bass … who has just about everything – imposing sound, beautiful legato, oodles of finesse” (The Independent). Also an active concert artist, he has performed at London’s BBC Proms and at New York’s Carnegie Hall, as well as with leading international orchestras, including the Chicago Symphony Orchestra and the Vienna Philharmonic. Ildar Abdrazakov kicks off the 17-18 season as Philippe II in the French version of Verdi’s Don Carlos at the Opéra National de Paris, followed by performances in the title role of Le Nozze di Figaro and as Assur in Rossini’s Semiramide at the Metropolitan Opera, New York. Likewise in Paris, he will give his highly anticipated debut in the title role of Mussorksky’s Boris Godunov. Further, he will be starring as Attila in the concert performances of Verdi’s opera at the Gran Teatre del Liceu Barcelona in the spring of 2018. On the concert podium Ildar Abdrazakov will be joined by Rolando Villazón for a tour through Europe in November and December 2017. The concerts in Prague, Berlin, Baden-Baden, Stuttgart, Munich, Paris and Vienna present the repertoire of their first joint album “Duets”, featuring duets from Italian and French operas, which will be launched on 22 September 2017 by Deutsche Grammophon. Ildar Abdrazakov is exclusive artist at the label since the beginning of 2017. Since his house debut in Don Giovanni under James Levine 2004, Abdrazakov has become a mainstay at the Metropolitan Opera. He headlined the gala opening of the company’s 2015-16 season in the title role in a new Sir Richard Eyre production of Le nozze di Figaro under James Levine. Previously, he sang the title role in a new staging of Borodin’s Prince Igor – a performance captured on DVD and Blu-ray by Deutsche Grammophon. Other notable Met-productions include his role debut as Henry VIII opposite Anna Netrebko in Anna Bolena to open the company’s 2011-12 season, Dosifei in Mussorgsky’s Khovanshchina, Escamillo in two productions of Carmen, and the title role in a new production of Verdi’s Attila under the baton of Riccardo Muti. At La Scala in Milan, Abdrazakov joined Muti in concert for the reopening of the theatre in 2004-05, and that same season he sang Moses in a production of Rossini’s Moïse et Pharaon that was recorded and released on CD and DVD. It was in the same role – in a new production led by Muti – that the bass made his Salzburg Festival debut in 2009, and he has also sung Moses with the Italian maestro in Rome. In 2016 Abdrazakov presented his first Solo Recital at La Scala. His first appearance at London’s Royal Opera House in 2009 saw him performing Verdi’s Requiem in concert with Sir Antonio Pappano, and he has since returned there to sing Don Basilio in Rossini’s Il Barbiere di Siviglia and Filippo II in Verdi’s Don Carlo. The title role in Le Nozze di Figaro was the vehicle for Abdrazakov’s 1998 house debut at St. Petersburg’s Mariinsky Theatre. Among his other signature roles are both the title role and Leporello in Mozart’s Don Giovanni, Méphistophélès in Gounod’s Faust - which he sang in a new production at the 2016 Salzburg Festival to great acclaim - and Berlioz’s La damnation de Faust, Oroveso in Bellini’s Norma; Selim in Rossini’s Il Turco in Italia and Assur in his Semiramide. 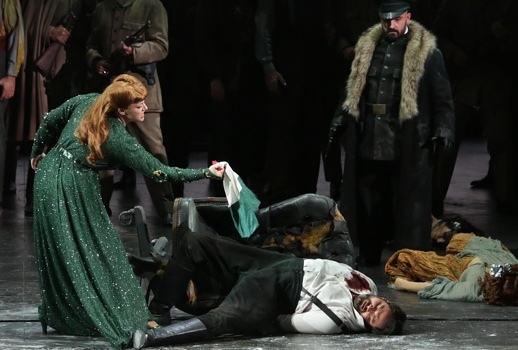 The Russian bass is noted for Verdi roles including Walter in Luisa Miller and the title character in Oberto and Attila, as well as Banquo in Macbeth and Filippo II in Don Carlo. Abdrazakov has appeared with virtually every major opera company in the United States and Europe. Besides those already mentioned, he has sung on the stages of the Salzburg Festival, Barcelona’s Gran Teatre del Liceu, Madrid’s Teatro Real, Paris’ Opéra Bastille, the San Francisco Opera, the Washington National Opera and the Los Angeles Opera. On the concert stage, he has given recitals in Russia, Italy, Japan and the United States, and has performed with orchestras including the Chicago Symphony Orchestra, the Vienna Philharmonic, the Leipzig Gewandhaus Orchestra, the Bavarian Radio Symphony, the Rotterdam Philharmonic, the Orchestre National de France, the Orchestra Filarmonica della Scala and Rome’s Accademia Nazionale di Santa Cecilia. Among the noted conductors with whom he has collaborated are Riccardo Muti, Valery Gergiev, James Levine, Gianandrea Noseda, Bertrand de Billy, Riccardo Frizza, Riccardo Chailly and Sir Antonio Pappano. Abdrazakov’s debut solo album Power Players, a celebration of the great Russian bass roles, was released in early 2014 on Delos, to great critical acclaim. His recording of Verdi’s Messa da Requiem with Riccardo Muti and the Chicago Symphony Orchestra won a Grammy Award, and he has recorded unpublished arias by Rossini with Riccardo Chailly and the Symphony Orchestra of Milan, as well as Giuseppe Verdi for Decca, and Cherubini’s Mass with Muti and the Bayerischer Rundfunk for EMI Classics. For Chandos he has recorded Shostakovich’s Suite on Verses of Michelangelo and Rachmaninoff’s The Miserly Knight, both with Gianandrea Noseda and the BBC Philharmonic. Abdrazakov signed an exclusive contract with Deutsche Grammophon in early 2017. The bass’s DVD releases include Moïse et Pharaon from La Scala, Oberto from Bilbao, Norma from Parma and Lucia di Lammermoor from the Metropolitan Opera. Marking the Verdi bicentennial, May 2013 saw Abdrazakov’s star turn in the title role of Attila immortalized on the Mariinsky label’s first DVD/Blu-ray release. Abdrazakov was born in 1976 in Ufa, then the capital of the Soviet republic of Bashkiria. His parents were both artists: his mother was a painter and his late father a director. Abdrazakov began acting in his father’s stage and film productions at age four, and these early experiences inspired him to pursue a career in the arts. Upon graduating from the Ufa State Institute of Arts, he joined the Bashkirian Opera and Ballet Theatre. In the late 1990s he won a string of prestigious vocal competitions: the Moscow Grand Prix named after Irina Arkhipova, the Glinka International Vocal Competition, the Rimsky-Korsakov International Competition, and the International Obraztsova competition. His 2000 win at the Maria Callas International Television Competition in Parma thrust him into the international spotlight and led to his debut at La Scala the following year. Since 2007, Abdrazakov has been an ambassador for the Zegna & Music project, a philanthropic initiative founded in 1997 by Ermenegildo Zegna, to promote music and its values. Abdrazakov’s concert attire is generously provided by the designer. Ildar Abdrazakov is also Artistic Director of the Elena Obraztsova International Academy of Music – where he was appointed by Obraztsova herself in 2014 – which opened in a gala concert in August 2015.